Mars comes closer to the Earth in July than at any time since its once-in-60,000-years record approach in 2003. It is just our luck that a dust storm that began a month ago now engulfs the entire planet so that the surface markings may now be glimpsed only through a patchy reddish haze. Both current Mars rovers, Opportunity and Curiosity, are also affected. This is the most intense storm to impact Opportunity since it landed in 2004 and the vehicle has shut down because it lost power as the dust hid the Sun and coated its solar panels. It is hoped that, after the storm subsides, friendly gusts of wind will waft the dust from the panels and Opportunity will revive. If not, this would mark the end of a remarkable mission which had been planned, initially, to last for only 90 days. Its sister rover, Spirit, succumbed in 2010 after becoming stuck in soft soil. Meanwhile, the more advanced Curiosity rover has been operating since 2012. Being nuclear powered, it is less vulnerable to the dust but its cameras are recording a dull reddened landscape beneath dusty orange skies. For watchers in Edinburgh, Mars rises in the south-east just before midnight at the beginning of July and is conspicuous at magnitude -2.2 but only 11° high in the south during morning twilight. Look for it 4° below the Moon on the 1st as Mars moves westwards in the constellation of Capricornus. Mars reaches opposition on the 27th when it stands opposite the Sun, rises during our evening twilight and is highest in the south in the middle of the night. By then it blazes at magnitude -2.8, making it second only to Venus in brilliance, and stands 58 million km away. A telescope shows it to be 24 arcseconds wide, with its southern polar cap tilted 11° towards us. Because Mars is edging inwards in its relatively elongated orbit, it is actually around 100,000 km closer to us on the 31st. As Mars rises at its opposition on the 27th it once again lies below Moon, but this time the Moon is deep in eclipse as it passes almost centrally through the Earth’s shadow. The total phase of the eclipse, the longest this century, lasts from 20:30 to 22:13 BST and it is in the middle of this period, at 21:22, that the Moon rises for Edinburgh. By 22:13, and weather permitting, it may be possible to see the Moon’s dull ochre disk 5° high in the south-east. From then until 23:19, the Moon emerges eastwards from the Earth’s dark umbral shadow, and at 00:29 it is free of the penumbra, the surrounding lighter shadow. The Earth stands at its furthest from the Sun for 2018 (152,100,000 km) on the 6th. Edinburgh’s sunrise/sunset times change from 04:31/22:01 on the 1st to 05:15/21:22 on the 31st. The Moon is at last quarter on the 6th and new on the 13th when a partial solar eclipse is visible to the south of Australia. First quarter on the 19th is followed by full moon and the total lunar eclipse on the 27th. 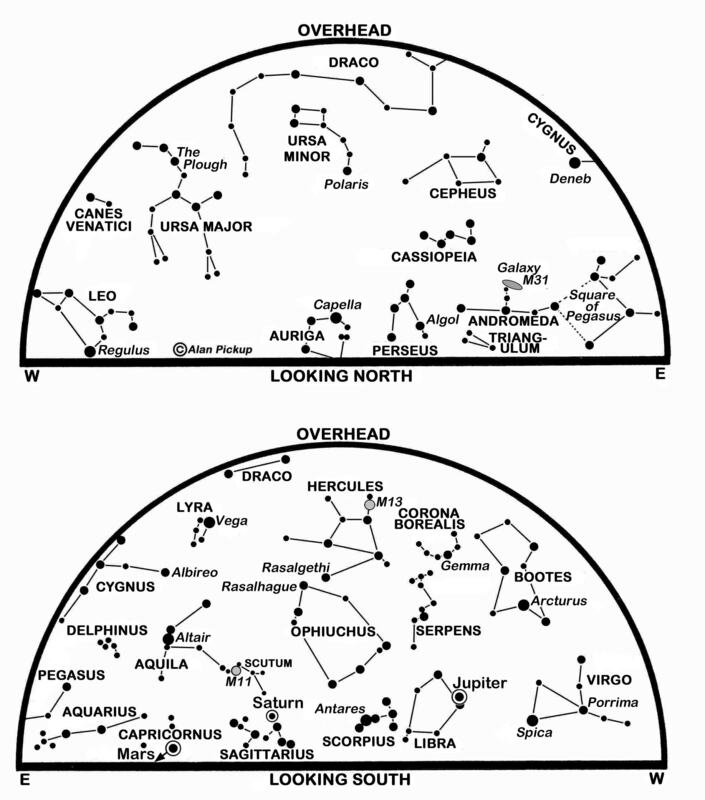 Our chart shows the corner stars of the Summer Triangle, Vega in Lyra, Altair in Aquila and Deneb in Cygnus, high in the south to south-east as the fainter corner stars of the Square of Pegasus are climbing in the east. 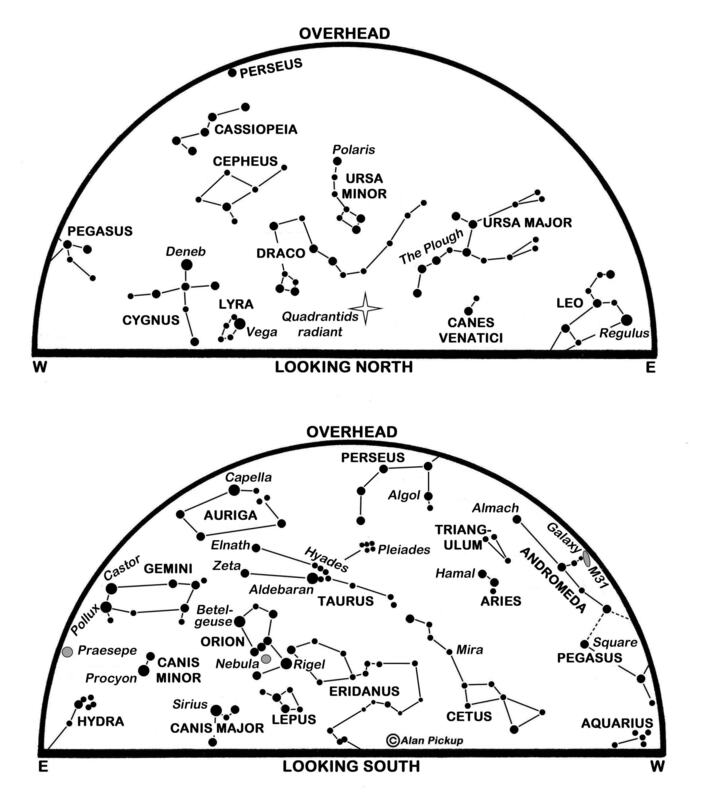 The Plough stands in the middle of our north-western sky and the “W” of Cassiopeia is similarly placed in the north-east. Venus sets before our chart times but is brilliant in the west at nightfall. It brightens from magnitude -4.0 to -4.2 but is sinking lower from night to night as it tracks southwards relative to the Sun. It passes 1.1° north of the star Regulus in Leo on the 9th as the much fainter planet Mercury (magnitude 0.4) stands 16° below-right of Venus. The little innermost planet stands furthest east of the Sun (26°) on the 12th but is a challenge to glimpse in the twilight this time around. Venus lies to the left of the young earthlit Moon on the 15th, below-right of the Moon on the 16th and, by month’s end, stands less than 10° high at sunset before setting itself some 70 minutes later. Jupiter lingers as a conspicuous evening object in the south-south-west at nightfall, sinking to set in the west-south-west one hour after our map times. Moving very little against the stars of Libra, it dims slightly from magnitude -2.3 to -2.1 and shows a 39 arcseconds disk when it lies below-left of the Moon on the 20th. Saturn reached opposition on June 27 and is at its best at our star map times, albeit low in the south at a maximum altitude of less than 12° for Edinburgh. At magnitude 0.0 to 0.2, it is creeping westwards above the Teapot of Sagittarius where it lies near the Moon on the 24th and 25th. Its disk and wide-open rings appear 18 and 41 arcseconds wide respectively. Our noctilucent, or “night-shining”, cloud season is now in full swing with sightings of several displays of these high-altitude blue-white clouds since late-May and further ones expected until August. Often with a wispy cirrus-like appearance, noctilucent clouds are composed of ice-crystals at heights near 82 km and glimmer above our northern horizon where they catch the sunlight long after our more usual lower-level clouds are in darkness. Their nature is still something of a mystery but it may not be coincidental that the first definite record of them dates only as far back as 1885, just two years after the cataclysmic eruption of the Krakatoa volcano in Indonesia. This is a slightly revised version, with added diary, of Alan’s article published in The Scotsman on June 30th 2018, with thanks to the newspaper for permission to republish here. Unless our passion is for observing the Sun, Scotland’s brief twilit nights can make June a frustrating month for stargazers. This month, though, three planets outshine all the stars, while a fourth, the handsome ringed world Saturn, is at its best for the year. We are approaching the summer solstice, due this year at 11:07 BST on the 21st when the Sun is overhead at the Tropic of Cancer. On that day, it passes 57.5° high in the south for Edinburgh at 13:14 BST, the time of local noon. The middle of the following night sees the Sun 10.6° below the northern horizon for Edinburgh and a mere 6.4° below for Lerwick in Shetland which is why, over northern Scotland in particular, only the brighter stars and planets may be glimpsed. Edinburgh’s sunrise and sunset times change from 04:35/21:47 BST on the 1st, to 04:26/22:03 on the 21st and 04:31/22:02 on the 30th. The Moon is at last quarter on the 6th, new on the 13th, at first quarter on the 20th and full on the 28th. Our chart is timed for around the middle of the night at present and depicts three of those planets as they line up low across our southern sky. Even brighter, though, is the brilliant Venus which blazes at magnitude -4.0 low in the west-north-west after sunset and sinks to set in the north-west at 00:36 BST on the 1st and just before midnight by the 31st. Although it is still drawing away from the Sun, Venus sinks lower each evening as it tracks further south in the sky, moving from below Castor and Pollux in Gemini to the western fringe of Leo by the 30th. 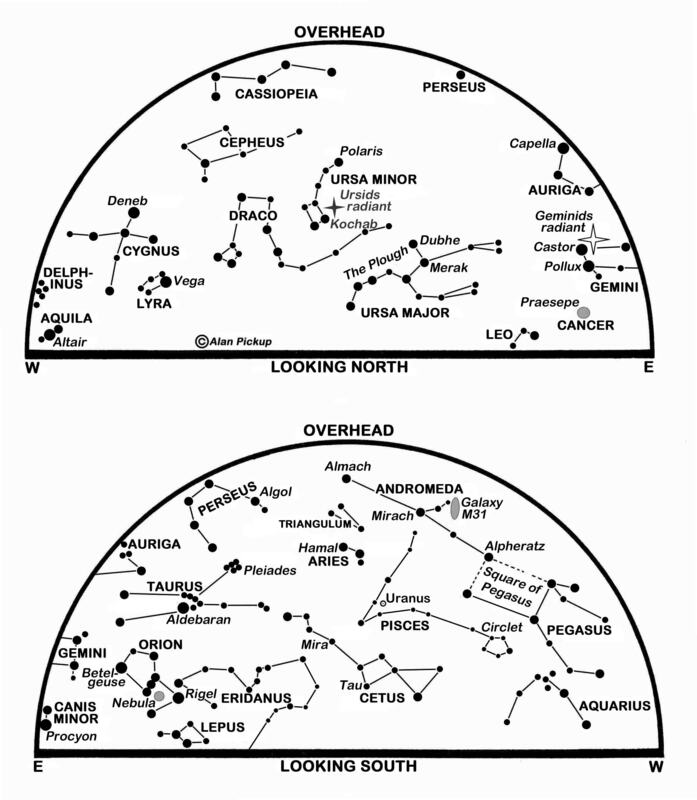 Look for it 6° to the right of the young Moon on the 16th with the Praesepe star cluster in Cancer just above and to the Moon’s right. On that evening, the planet is 174 million km distant and appears through a telescope as a 75% illuminated disk of diameter 14 arcseconds. Mercury joins Venus in the evening twilight later in the month but is a real challenge to spot through binoculars from our latitudes. For us, the little innermost planet shines at about magnitude 0.0 but stands only 2° high in the north-west one hour after sunset from the 20th onwards. 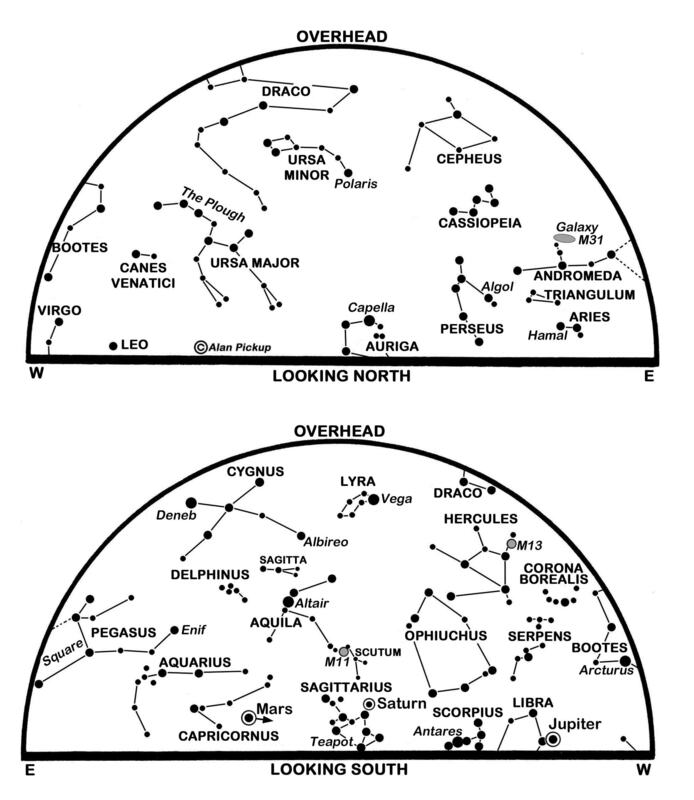 Foremost among the planets on our star chart is Jupiter which is prominent at magnitude -2.5 in Libra as it moves from low in the south-south-east at nightfall to the south-south-west by the map times. Having stood directly opposite the sun at opposition on 9 May, it dims slightly to magnitude -2.3 and shrinks to 41 arcseconds across by June’s end. Binoculars reveal its four main moons to either side and the interesting double star Zubenelgenubi less than a degree to its south over the coming nights. Catch it just below the Moon on the 23rd. This month it is Saturn’s turn to reach opposition when it stands 1,354 million km away on the 27th when it also happens to lie close to the Moon. 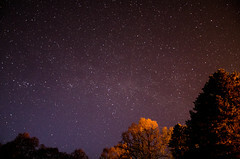 It passes less than 12 degrees high in the south as seen from Edinburgh in the middle of the night as Vega, the leading star in the Summer Triangle, passes just to the south of overhead. Improving from magnitude 0.2 to 0.0 to equal Vega in brightness, Saturn is creeping slowly westwards just above the Teapot of Sagittarius though this asterism barely clears our southern horizon. Viewed telescopically, Saturn’s disk is 18 arcseconds broad at opposition while its rings span 41 arcseconds and have their north face tipped 26° towards us. The night’s final planet, Mars, is rising above Edinburgh’s south-eastern horizon at our map times and climbs to lie 10° high in the south-south-east before dawn. Its orange hue is already conspicuous at magnitude -1.2 and it more than doubles in brightness to magnitude -2.1 by the 30th. Moving eastwards against the stars of Capricornus, it reaches a so-called stationary point on the 28th when its motion reverses to westerly. Mars approaches from 92 million to only 67 million km during June while its orange-red disk swells from 15 to 21 arcseconds in diameter, becoming large enough for most decent telescopes to reveal something of its surface detail and that its icy south polar cap is tipped at 15° to our view. Mars lies near the Moon on the morning of the 3rd and to the left of the Moon on the 30th. I mentioned solar observing at the beginning of this note since our long summer days give ample opportunities for viewing the Sun’s surface, or so we hope. Of course, I should repeat the serious warning that we must never look directly at the Sun through any binoculars or telescopes – to do so invites critical damage to the eyes, if not blindness. Instead it is possible to project the Sun’s image onto a card held away from the eyepiece. Alternatively, obtain an inexpensive but certified “solar filter” and follow the instructions carefully on how to employ this. Of particular interest are sunspots, dark regions on the solar surface that last for anything from a day to several weeks and mark magnetic storms. Their numbers fluctuate in a cycle of roughly 11 years and, following a peak in activity in 2014, are low at present as we near a so-called sunspot minimum which might be due in 2020. However, sunspot numbers have plummeted in recent months and more than half the days in 2018 have been spotless so far, so it is suggested that the official minimum could occur rather earlier than expected. This is a slightly revised version, with added diary, of Alan’s article published in The Scotsman on May 31st 2018, with thanks to the newspaper for permission to republish here. February’s main planetary focus is the trio of Jupiter, Mars and Saturn in our predawn sky while Venus and Mercury begin spells of evening visibility later in the period. As the night falls at present, though, our eyes are drawn inevitably to the sparkling form of Orion in our south-eastern sky. 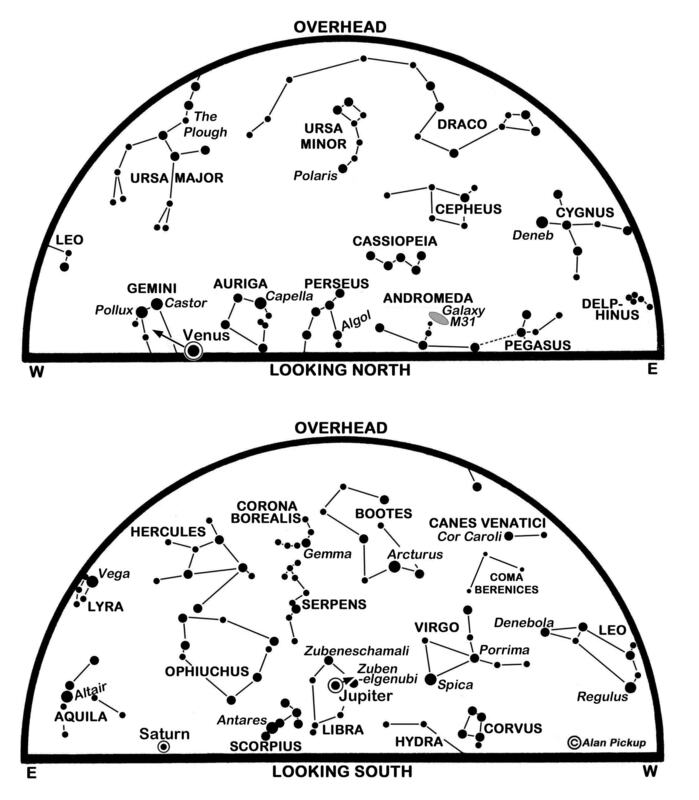 Perhaps the only constellation that most people can recognise, it is one of the very few that has any resemblance to its name. It is easy to imagine Orion’s brighter stars as the form of a man, the Hunter, with stars to represent his shoulders and knees, and three more as his Belt. Fainter stars mark his head, a club and a shield, the latter brandished in the face of Taurus the Bull, while his Sword, hanging at the ready below the Belt, contains the fuzzy star-forming Orion Nebula, mentioned here last month. 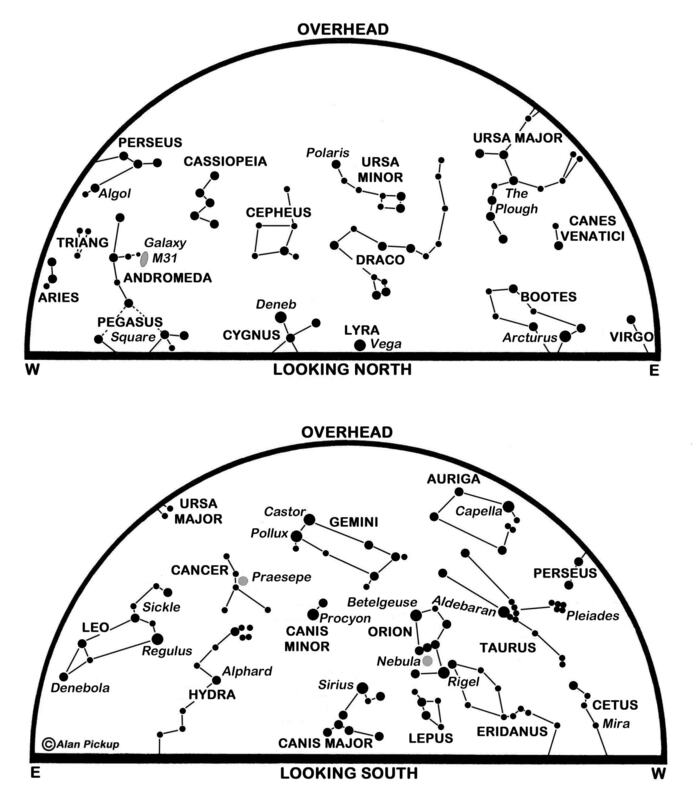 Since he straddles the celestial equator, the whole of Orion is visible worldwide except from the polar regions. 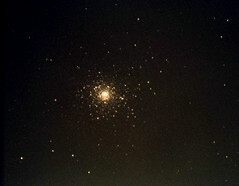 Observers in the southern hemisphere, though, are seeing him upside down as he crosses the northern sky during their summer nights. 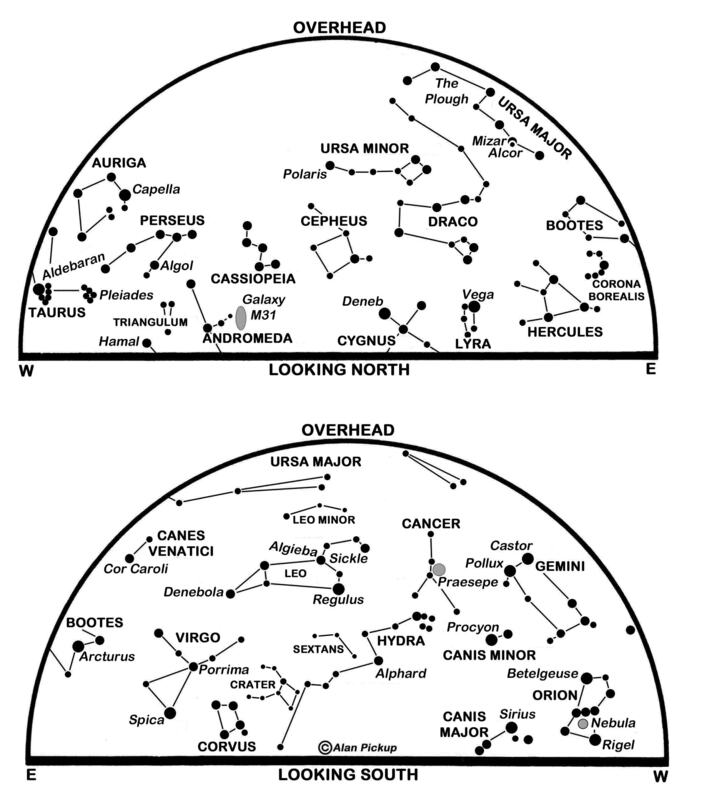 For us, Orion passes due south about one hour before our map times. The line of Orion’s Belt slants down to our brightest nighttime star, Sirius, in Canis Major which is one of the two dogs that accompany Orion around the sky. 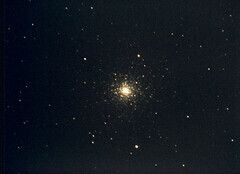 The other, Canis Minor, stands higher to its left with the star Procyon. This, with Sirius and Betelgeuse in Orion’s shoulder, form the equilateral Winter Triangle whose centre passes some 30° high in the south at our map times. The Belt points up to Aldebaran in Taurus and, much further on, to the eclipsing variable star Algol in Perseus which we highlighted last month. This month Algol dims to its minimum brightness at 22:09 GMT on the 7th, 18:58 on the 10th and 23:54 on the 27th. The Sun climbs 9.5° northwards during February as sunrise/sunset times for Edinburgh change from 08:07/16:46 on the 1st to 07:07/17:45 on the 28th. A total lunar eclipse occurs when the Moon is full on 31 January, but finishes before the Moon rises for Scotland. The Moon lies close to Regulus in Leo on the 1st and is at last quarter on the 7th. The new moon on the 15th brings a partial solar eclipse for Antarctica and southernmost South America. First quarter occurs on the 23th when, late in the afternoon, it occults Aldebaran – a telescope should show the star disappearing behind the Moon from 16:37 to 17:47 as viewed from Edinburgh. The Moon is not full again until 2nd March. Jupiter, brighter than Sirius and the most conspicuous of our morning planets, rises at Edinburgh’s east-south-eastern horizon at 02:27 on the 1st and 00:51 by the 28th, and climbs to pass 17° high in the south before we lose it in the dawn twilight. Creeping eastwards in Libra, it brightens from magnitude -2.0 to -2.2 while, viewed telescopically, its cloud-banded disk swells from 36 to 39 arcseconds is diameter. Mars follows some 12° to the left of Jupiter on the 1st, rising in the south-east at 03:41 and shining at magnitude 1.2 less than a Moon’s breadth below the multiple star Beta Scorpii, Graffias, as they climb into the south. The planet tracks quickly eastwards against the stars, sweeping 4° north of the magnitude 1.0 red supergiant Antares on the 10th and making this a good month to compare the two. The name Antares means “rival to Mars” and both are reddish and, this month at least, very similar in brightness. By the 28th, Mars stands 27° from Jupiter, rises at 03:24 and shines at magnitude 0.8. Saturn, now also a morning object as it creeps eastwards above the Teapot of Sagittarius, rises in the south-east at 06:13 on the 1st and by 04:37 on the 28th when it shines at magnitude 0.6 and is 17° to the left of Mars before dawn. Catch the waning Moon above-left of Jupiter before dawn on the 8th, above Mars on the 9th and above-right of Saturn on the 11th. Venus is brilliant at magnitude -3.9 as it pulls slowly away from the Sun into our evening twilight but we need a clear west-south-western horizon to see it. Its altitude at sunset doubles from 4° on the 8th to 8° by the 28th, by which day it sets more than one hour after the Sun. As the month ends, use binoculars to look a couple of degrees below-right of Venus for the fainter magnitude -1.3 glow of Mercury as the small innermost planet begins its best evening apparition of the year. For a real challenge, try to spy the very young Moon when it lies just 1.2° below-left of Venus soon after sunset on the 16th. Barely 20 hours old, the Moon is only 0.7% illuminated and may be glimpsed as the thinnest of crescents. It is more noticeable, and impressively earthlit, as it climbs steeply away from the Sun over the following days. This is a slightly revised version of Alan’s article published in The Scotsman on January 31st 2018, with thanks to the newspaper for permission to republish here. Our evening sky is bursting with stellar interest but devoid of bright planets. Instead, Mars partners Jupiter in the predawn in the south-east to south while the impending spectacle of the annual Quadrantids meteor shower is rather blunted by bright moonlight. 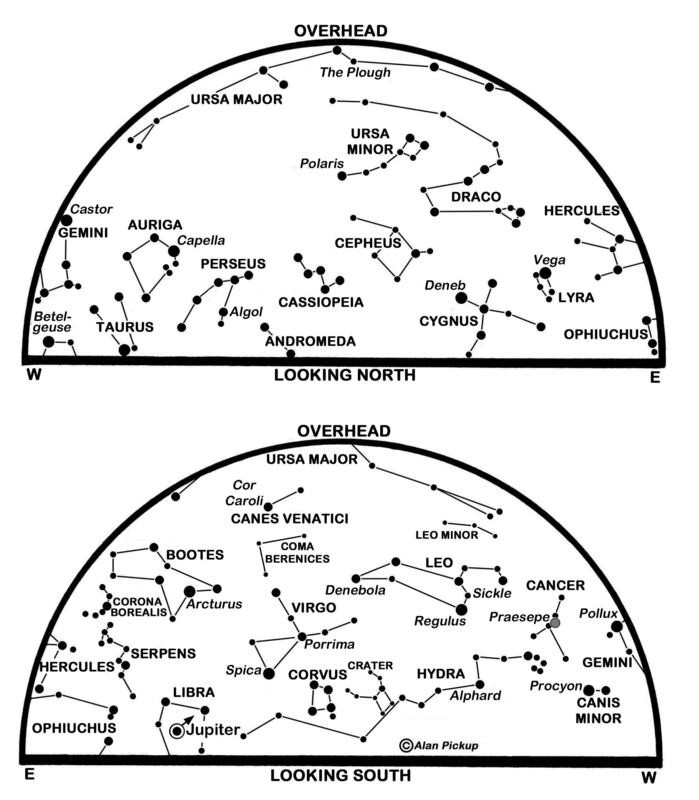 The charts show Taurus high on the meridian, above and to the right of the unmistakable form of Orion whose brightest stars are the distinctly reddish supergiant Betelgeuse and the contrasting blue-white supergiant Rigel. Between them lie the three stars of Orion’s Belt, while hanging below the middle of these is his fainter Sword with the Orion Nebula. The latter’s diffuse glow, visible to the unaided eye under decent conditions and obvious through binoculars, comes from a region where new stars and planets are forming. It lies some 1,350 light years away and is one of the most intensively studied objects in the entire sky. Two iconic variable stars, Algol and Mira, are well placed in the evening. Algol in Perseus, the archetype of eclipsing variable stars, has two unequal stars that orbit around, and hide, each other every 2 days 20 hours and 49 minutes. Normally Algol shines at magnitude 2.1 and is almost identical in brightness to the star Almach in Andromeda, 12° to its west and labelled on the chart. However, when Algol’s fainter star partially obscures its brighter companion, their combined light dips to magnitude 3.4, one third as bright, in an eclipse that lasts for about 10 hours and can be followed with nothing more than the naked eye. This month, Algol is at its mid-eclipse faintest at 02:45 on the 13th, 23:34 on the 15th and 20:23 on the 18th. Mira, by contrast, is a single red giant star that pulsates in size and brightness every 332 days on average. It lies well to the west of Orion in Cetus, the sea monster of Greek mythology which was slain by Perseus when he rescued Andromeda. During a typical pulsation, Mira varies between about magnitude 3.5, easy for the naked eye, and the ninth magnitude, probably needing a telescope. Unlike Algol, whose variability is like clockwork, Mira is less predictable and it has been known to touch the second magnitude, as it did in 2011. Now is the time to check, for it is close to its maximum as the year begins. Markedly orange in colour, it dims only half as quickly as it brightens so should remain as a naked-eye object throughout January. Named for the extinct constellation of Quadrans Muralis, the Quadrantids meteors diverge from a radiant point in northern Bootes which lies low in the north at our map times and climbs to stand high in the east before dawn. Meteors are seen between the 1st and 6th but peak rates persist for only a few hours around the shower’s peak, due this time at about 21:00 on the 3rd when 80 or more meteors per hour might be counted by an observer with the radiant overhead in a clear moonless sky. However, with the radiant low in the north and moonlight flooding the sky at the time, expect to see only a fraction of these, perhaps trailing overhead from north to south. Earlier on the 3rd, at 06:00, the Earth reaches perihelion, its closest point to the Sun in its annual orbit. Edinburgh’s sunrise/sunset times change from 08:44/15:49 on the 1st to 08:09/16:44 on the 31st. The Moon is full at 02:25 on the 2nd, only four hours after it reaches its closest point to the Earth for the entire year. There is a relatively modern obsession in dubbing such an event a supermoon, because the Moon appears 17% wider than it does when at its furthest. The difference between an average full moon and this one, though, is hardly “super” and far from obvious to the eye. The Moon’s last quarter on the 8th is followed by new on the 17th, first quarter on the 24th and full again on the 31st when it passes through the southern half of the Earth’s shadow in a total lunar eclipse. Sadly, the event is over before sunset and moonrise for Britain. Venus slips around the Sun’s far side to reach superior conjunction on the 9th and leave Jupiter as our brightest morning planet. Seen from Edinburgh, the latter rises in the east-south-east at 04:04 on the 1st and is climbing more than 15° high into the south before dawn. Conspicuous at magnitude -1.8 to -2.0, it creeps 4° eastwards to the east of the famous double star Zubenelgenubi in Libra and rises at 02:30 by the month’s end. Mars, much fainter at magnitude 1.5, lies almost 3° above-right of Jupiter on the 1st and tracks more quickly eastwards to stand only 14 arcminutes (half a Moon’s breadth) below Jupiter before dawn on the 7th. The pair lie below the waning Moon in our predawn sky on the 11th when Jupiter’s cloud-banded disk 34 arcseconds wide and visible through any telescope, while Mars is still too small to appear interesting. Mars is brighter at magnitude 1.2 and stands 12° to the left of Jupiter by the 31st. Mercury, bright at magnitude -0.3, may be glimpsed through binoculars as it hovers very low above our south-eastern horizon for more than 90 minutes before sunrise until the 8th. Given a clear horizon it may still be visible on the 15th when it stands 2.6° below-right of the vanishingly slender waning Moon. Saturn, half as bright at magnitude 0.5, lies 4° right of the Moon on that morning but is easier to spot by the month’s end when it rises almost two hours before the Sun. This is a slightly revised version of Alan’s article published in The Scotsman on December 30th 2017, with thanks to the newspaper for permission to republish here. At the recent Member’s Evening on 3 November 2017, Mark Phillips gave a presentation about his experience of astro imaging. The front page of Mark’s Astro Imaging presentation – click on the image to access the presentation. Astro imaging is a large topic so the presentation covers, at a general level, the sorts of imaging that I do with my own equipment. It describes the techniques, software and equipment I use, and shows some of the results. I hope it will be an encouragement to others to try astro imaging maybe for the first time or maybe to get back into it again. 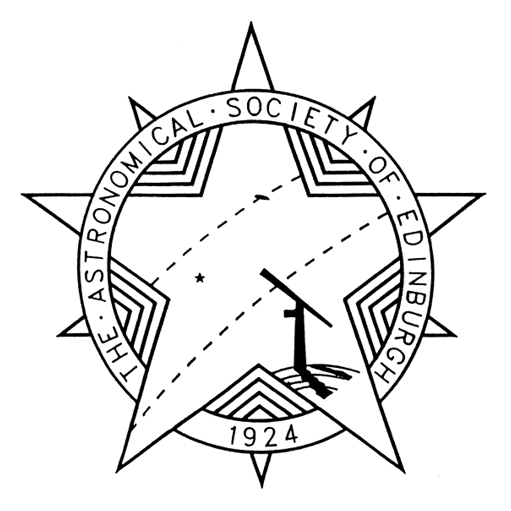 Mark has been a member of the ASE for just over a year, having found us through his love of astro imaging.